For Valentine’s Day, Professor Real Estate® Suzanne Hollander, sends 4 Property-Love-Lessons to U, from Medellin, Colombia, winner of the Most Innovative City of the World Award jointly given by The Wall Street Journal and Urban Land Institute! Click here to contact Professor Real Estate® to help you apply these lessons to create value in a property and city that you love! Property-Love-Lesson #1 – Innovative Transportation Builds Property Values and Business! 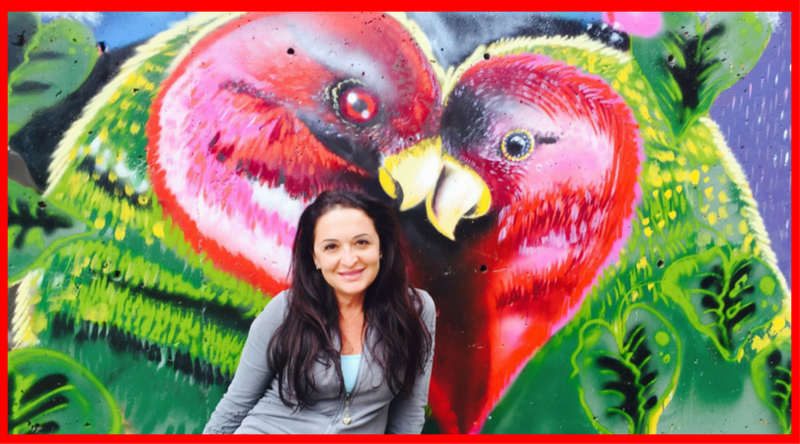 In the photo, Professor Real Estate® Suzanne Hollander is in front of a graffiti-art-heart at the top of a steep hill in Comuna 13, previously one of the most dangerous neighborhoods. Suzanne reached this summit riding a 6 minute, 384 meter escalator. The bright orange escalator, like the kind you see in a department store, was built into the hillside in 2011 and has 6 segments…its like going to the 6th floor of Macys! The unique, stylish, functional escalator opened access to this previously isolated hillside neighborhood, brings business to the area and is a piece of art itself. When you look at the photo of the escalator, below, think about how you can come up with innovative solution to to bring business to your city or neighborhood! Property-Love- Lesson #2 Art Builds Property Values and Business! Professor Real Estate® Suzanne Hollander loves how art builds real estate values and she sees connections of art and design to real estate all over the world, especially in Miami where she lives. In Medellin, Comuna 13, graffiti artists activated each of the escalator’s 6 levels with huge murals. Today, tour group’s visit and artists sell their work from this area. When you think about how to bring excitement, pedestrian activity and value to your neighborhood, consider the positive impact art brings! Property-Love-Lesson #3 Public Parks Activate Real Cities! Professor Real Estate® Suzanne Hollander loves the Botero Plaza, a public park with 23 Botero sculptures to view, touch, climb and enjoy! This art filled public park creates a unique identity for Medellin as a City and activates the downtown area with pedestrians and business. When you think about how to activate a business area or invigorate a new real estate project, think about how a public park could help you City or project! Property-Love-Lesson#4 – Travel Opens Your Mind to Innovative Ways to Create Value! Looks like the guy at the bottom of this sculpture has a lot on his mind! LOL! Professor Real Estate® Suzanne Hollander loves real estate travel and brings back lessons about design, use of public space, transportation, city building, property rights, valid title an access to credit mortgages. Suzanne shares these lessons with you her followers and in her classroom! Click here to watch Professor Real Estate® travel lessons from Cuba, Argentina, Peru, Panama and Washington, D.C.
Suzanne Hollander Professor Real Estate® provides real estate education to nations and helps people make smarter real estate decisions. Suzanne is a real estate broker, attorney, educator, speaker, commentator and voice for real estate, housing and property rights, frequently quoted in the media, including Wall St. Journal Money Watch, YahooFinance!, Miami Herald, El Nuevo Herald, The Palm Beach Post, Wallethub, The Real Deal, Mercado De Dinero USA, GlobeStreet, Scotsman Guide Commercial Real Estate edition, BizNews and The Capital Gazette Newspaper. « Suzanne Hollander Wins Best Real Estate Course Award! > Art and Real Estate > Sending Property Love Suzanne Hollander On Site: Medellin, Colombia!